New England Confectionery Company, Inc.
Today was Day #1 of Chocolate and Peanut Butter Theme Week. In the mid-1900s, a neurosurgeon named Dr. Wilder Penfield did pioneering work on the brain and memory. He found that when a patient's brain was stimulated, memories of conversations or events could be evoked -- including not only factual information, but also sounds and feelings associated with a conversation or event being recalled. If my brain were similarly probed for cocoa-related recollections, I'm sure these evocations would be tied to many happy childhood chocolate memories -- days spent in movie theaters, ice cream shops, and local markets, on backyard lawns having picnics, at birthday parties -- all places where there was bound to be chocolate. In 2006 and 2007, when I started this site, ChocolateBanquet.com, I featured many U.S.-made chocolate bars. However, for some strange reason, I missed several peanut butter-related candy bars. I'll try to make up for that this week, starting with two red-wrappered candy bars: 1.) the Zagnut bar from The Hershey Company (Hershey, PA) -- originally introduced in 1930 by the D. L. Clark Company, and 2.) the Clark bar from the New England Confectionery Company, Inc. (NECCO) (Revere, MA). 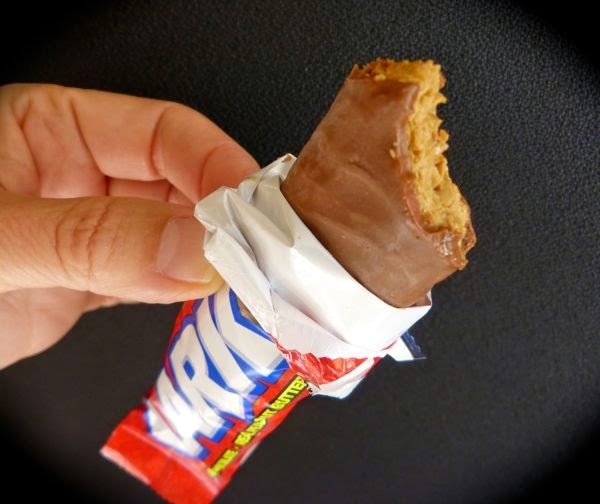 I unwrapped the Zagnut bar to find a crunchy peanut butter and coconut "shell" -- think of eating the crunchy, crispy sweet peanut butter center of a Butterfinger bar. The cocoa incorporated into this bar takes a back seat to the other ingredients. 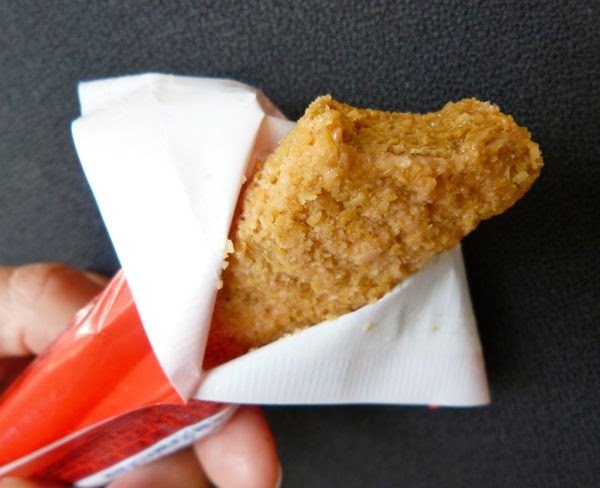 Unlike most chocolate-coated candy bars, you can nibble on this without chocolate meltage on your hands. To ensure I met my recommended daily allowance for chocolate, I followed this up with the Clark bar. 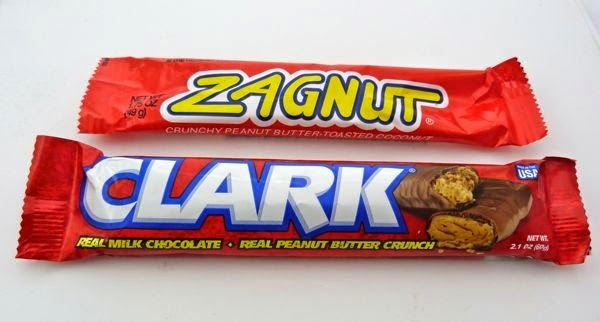 The Clark bar had a similar crispy, crunchy peanut butter core, and was coated with a layer of "real" milk chocolate. Like the Zagnut bar, there was also a hint of molasses and coconut. NECCO offers an upbeat stable of mid-century retro confections, including Squirrel Nut Zippers, colorful Candy Dots, NECCO wafers, Mary Janes, and Sweethearts.